I'll be leaving on Friday for a whirlwind tour of the west coast and whatever you would call the Arizona/Nevada region (the Census calls it West-Mountain Division?). 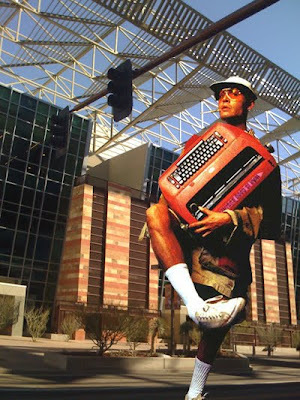 By Tuesday of next week, I'll be at GREENBUILD in Phoenix, and will be blogging as fast as I can on the frustratingly small keyboard of my new netbook (expect more typos than normal)... I thought I'd give you dear readers my thoughts on what to attend, and I'd love to see some comments from locals about places I need to see in San Diego, Las Vegas, and of course Phoenix. Frankly, I don't know jack about Phoenix, so if you're looking for sightseeing and or dining options I'm not the guy you want to be talking to... Greensource was smart enough to ask a bunch of locals, mostly architects (including one guy who eschews the "III" suffix at the end of his name in favor of a "3"... I sincerely hope to meet Mr. DeBartolo, 3 during my travels), though those of you who don't wear black all the time can see the thoughts of a community organizer and ArchRecord Editor. In general there seems to be enough fodder and pretty pictures on that sight to allow me to skip any further research on this subject. If you haven't booked a hotel yet... good luck! There's nothing left that I could find within walking distance of the convention center, but I was able to find a few hotels near the new light rail line. So... I've finally registered for my sessions at Greenbuild (note: some things are already at the wait-list stage... do it today if you haven't already! ), and I have to admit that I'm a little disappointed to see that everything except for the master speaker sessions and specialty updates are panel discussions... There's a time and a place for those, but I wish a few of these session topics would go into the depth and detail that only a single speaker or more formal lecture can deliver. In any case, there's clearly boatloads of talent worth seeing. Official schedule info can be found here. In general, you have the option for paying for tours or workshops in place of the sessions included in your registration, and everything I'm going to discuss focuses on the 'free' sessions. Here's my schedule and other sessions I'd like to see if I could be two (or in some cases four) places at once. Sessions in bold are the ones I plan to attend. I get to Phoenix in the late evening, but those around earlier may want to head to the Expo Hall grand opening that starts at 5:30 after checking in. After that there's a party from the folks at GreenGuard that starts at 8:00 off-site at a pub called Coach and Willies, but I'm not sure if that's invite-only or open to the public... the evite I got wasn't exactly clear. I don't know about you, but our firm has seen a very elevated interest in LEED-EB certification lately, and I'm looking to bone up on the subject. I haven't personally met Dayna Baumeister of the Biomimicry Guild, but I've read her boss' book and am familiar enough with their work to know it should be an interesting session. When you consider Bill Reid of Integrative Design Collaborative is also on the panel (saw an excellent presentation by him at a local conference), this is sure to be a great discussion. I'm recommending this session solely on the strength of a presentation I saw Kimberly Pexton give to our offices about a year ago... she clearly understood how to get LEED done on the ground. She is the Director of Sustainable Construction for Hitt Contracting, a large general contractor with a broad range of LEED experience. There is only one session offered at this time, the "Executive Roundtable", and I'm going to have to miss at least part of it due to prior plans, but this seems like a very interesting session featuring none other then R.Fed himself with a distinguished panel of Fortune 500 Presidents, COOs, and Senior VPs. The Specialty Update series are the sessions that are probably going to be boring but the most useful as far as your day to day job as a LEED AP is concerned (Today's topics: Earning and Maintaining LEED Credentials, LEED for Retail Practical Strategies, The Evolving Recognition of Certified Wood Products, etc.). I could also suspect, but can't confirm, that many of these sessions will be available online after the conference is over. I'm unfortunately going to miss the Wednesday updates, but will work to get the most important announcements back to you after the fact. The founders of Archinect, Inhabitat, and Architecture for Humanity (Cameron F'in Sinclair!)... need I say more? Though I'm punching myself for reverting to this worn out cliche, Net Zero is the new LEED, and it can't hurt to see what's available today to make it happen. A group of lawyers in a room discussing pitfalls of LEED and how to avoid them. It's been done before and it will be done again, but I haven't been to one of these yet where I didn't learn something that could (or possibly already has) keep me out of a lawsuit. Also, most lawyers I've met are funny. Frankly, I'm doing this one for you guys... Even the title sounds tedious! The pilot credit library is new to me, and I hope to be able to fill in the blanks to you once this session is over. It also appears that the USGBC will be listening to attendees about how to make this process go smoothly, so hopefully I'll be able to make a difference, however small, for the better here. I think we undersell the value of IEQ improvements in general, and I hope this session would help arm you with more data to support these efforts. Go where the work is, right? I haven't heard of this yet, and though the name sounds an awful lot like the DoD's SPiRit rating system (good riddance! ), the website indicates it's more of a system for tracking building performance AFTER construction, which is never a bad idea. I'm not sure what to expect from this, but I must admit I'm curious. I'll be able to make this round of updates, and I've chosen "SU17, LEED Online V3: Executive Status Update" to attend because of their promise to describe "user experience with it to date, and USGBC's resolution of challenges that have arisen since go-live." Let's only hope Mr. Opitz isn't too mad at me for not publishing an interview he was kind enough to offer me! Sorry about that (seriously)! Benchmarking is something near and dear to my heart, as I hope to get a comprehensive post-occupancy assessment program off the ground at work in the next few months. Buildings not living up to their energy models is one of the core complaints about LEED at the moment, and I'm always curious to hear anything about ways to address that issue. I probably would have avoided the "Makes Cents" reference personally, but you can't argue with the value of the topic... Having Tom Paladino on the panel means you're getting one of the most knowledgeable sustainable valuation experts in front of you to tell you about it, too. Another lawyer panel, but since I couldn't make the first one I've decided to go with this one. I'm curious about the specific tie to LEED v3, and interested to hear if there's any specific legal implications tied to the new system. This is another instance of me recommending a session based on the merit of a speaker I've seen before and was extremely impressed with. Mike Nicklas of Innovative Design tends to rigorously measure the performance of the systems he designs, and I have little doubt that his recommendations will be effective. Hotels are a tricky animal when you consider that the owners are generally very (sometimes obsessively) concerned with the perceptions of the guests. What you can push on an employee (say, low flow sinks) might not fly in a hotel, and I'm curious to hear how they resolve these situations. REAL LIFE LEED MEETUP??? - 8:00PM-TILL??? I wish I had the resources to throw all you readers a big, all expenses paid party, but let's be honest... it's just not happening. Thursday night is open for me though, and if someone local could recommend a good bar (within walking distance of course) for a bunch or RLL'ers to meetup informally I'll put up a separate post letting everyone know and we'll see what happens... To be honest, I've only met one person who's read my blog outside of South Carolina in person! Again, I'm a little obsessed right now with post-occupancy assessments, and I'm really looking to learn how to do them right. I can't imagine two better tutors than Vivian Loftness and Kim Fowler, a PNNL researcher involved in developing a common metric to help build a much needed database of performance outcomes that could be compared across building types. You don't look like I pictured. Let me guess... you thought I was pimpled and 300+ lbs? If you want to see some of the local architecture (sustainable or otherwise), you will need a car. For example, Taliesin can only be reached by car unless you want to spend the entire day in buses (one way) and walk for a bit. Which receptions are you attending? Turner is having one Tuesday 7:30 pm -9:30 pm at the Arizona Science Center. GreenGuard is Tuesday 7 pm - 9:30 pm at Couch & Willie's. Do you know of any others??? Joel, not at all. Your blog is an office favorite. Thanks for the good work! Joel, I agree that the panel format for Greenbuild is a mile wide and two inches deep. It has been a frustration of mine for years. In my talks with USGBC about this, the attitude seems to be they are trying to reach a broad audience and that there are other conferences for depth. Unfortunately, there aren’t budgets to attend those. We know USGBC reads your blog, so maybe if we could re-emphasize the need for deeper content professional tracks alongside the broad general stuff future Greenbuilds might be better. I for one would love to sit through an hour and half presentation on the Q-factor for energy modeling green roofing systems, or diving through the technical analysis of current energy intensities and returns on concentrating solar plants vs. PV modules and various hybrids. Keep up the good work! I will be @ Greenbuild. I shoud be packing since my flight is in 5 hours. Plan to do some geocaching & waymarking, if time permits. Attending the bike tour on Friday...Looking forward to it! There are two of us (designers) and we have a car so maybe we can arrange something? Hope to meet people this week!